After a freshening and restorative trip home to Boston, my village of origin, New York, home of 2 of our 4 children and their children. our grandchildren, and Hawaii, home of a third, I felt I had come home. Returned to my beginnings seeing family and college roommates at a shocking to even think of 50th reunion, old Tokyo friends, family cousins and their spawn. I felt I belonged again despite the long hiatus away from my beginnings. The journey confirmed some part of me that is not always sure it belongs in my transplanted world, Japan. The trip reassured me and maybe answered some unvoiced questions as to why I am the way I am. Of who I am. Why I am. That stubborn core that I somehow can’t shake. Welcome home front door created by Ruby Momo Kaminsky, 10, glorious, resourceful granddaughter made us feel we were where we belonged and were loved. 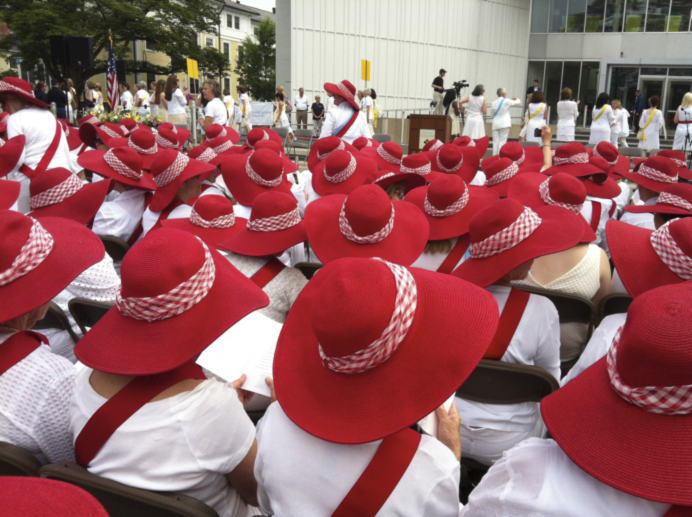 The month in the United States was reaffirming and centering and made me feel I belonged. My family was there and I still felt at home there with a bit of a foreign (exotic) twist. I loved the of-courseness of it. Things happened pretty much as I expected they would. One of the strange joys of Japan is that every day is still a surprise. There is always something unexpected because I don’t have that inherent foundation/ understanding of how things will/should be. But then wait! After returning home to Tokyo, I exclaimed Tadaima! I’m home! a Japanese expression meaning I’m back to where I am from. And I meant it. Returning to Tokyo after all these years of leaving and returning, I still have a real sense of coming home. The same feeling of returning home as when I return to Boston or New York. I feel a sense of belonging, a spirit-filling reassurance that I feel when I come back together with myself. A sense of belonging in this fractured and multi directional world is a precious feeling of togetherness, of wholeness. It is rare and I treasure it. Coming home to Tokyo is coming home to the wellspring that fills up my mind with energy and inspiration and power sources. My well is replenished and my booster cables attached to their power base. I am reconnected. Ideas start to flow. Here are some of the places and images that give me power, that reach out to me and warm my soul. They make me glad that Tokyo and Japan are home to me, earthquakes notwithstanding. Two sacred places on our small road. 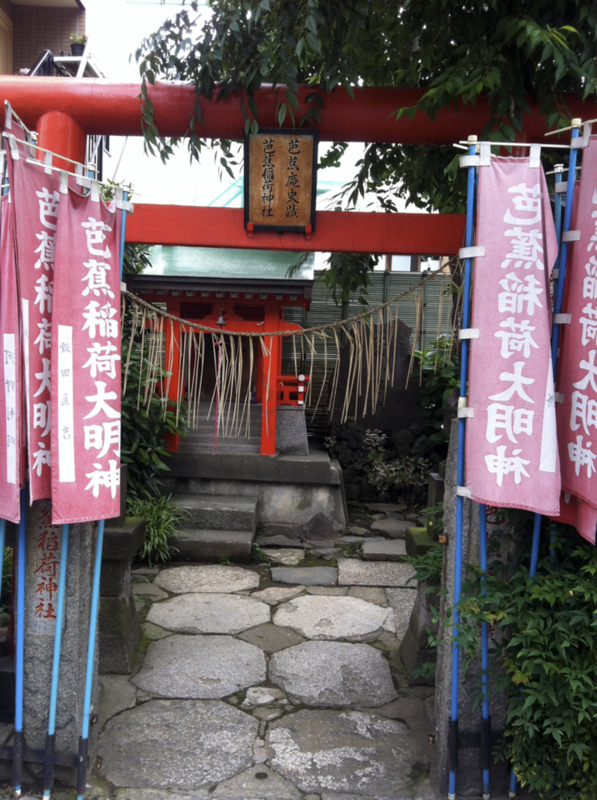 Basho Inari Jinja, a shrine to the beloved 18th century wandering haiku poet, Matsuo Basho. 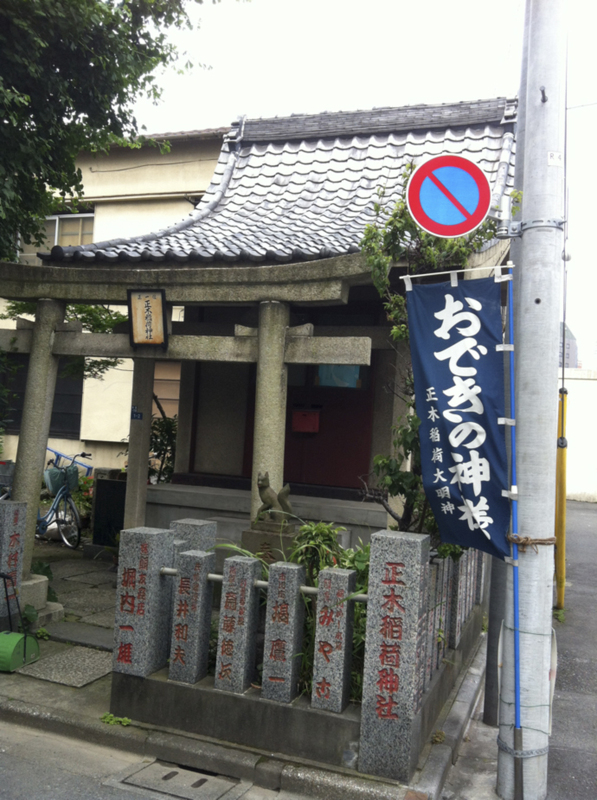 And below, ODeki Jinja, a shrine dedicated to improving complexions – think of it! Does it do wrinkles? 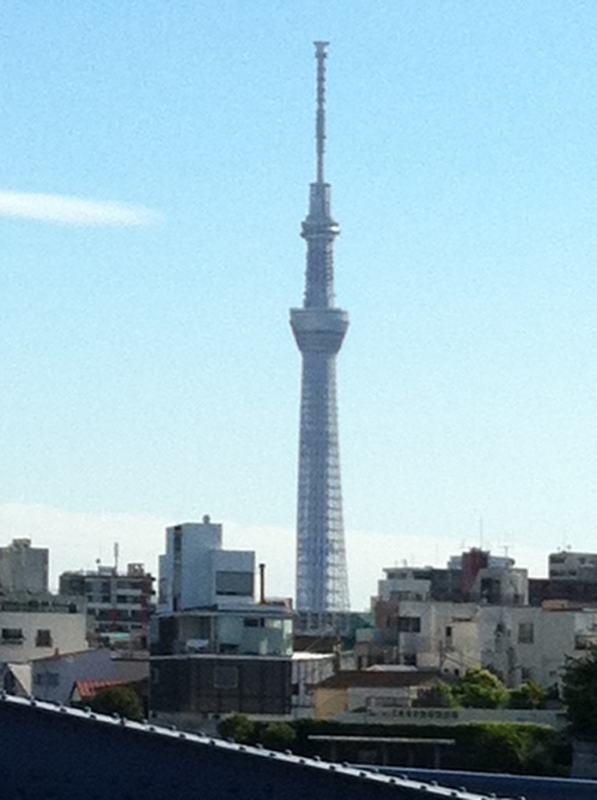 The new Sky Tree, impressive in size, but disappointing in design and lighting. Garbage men, highly motivated, run to get their job done. Immaculate, thorough, helpful. 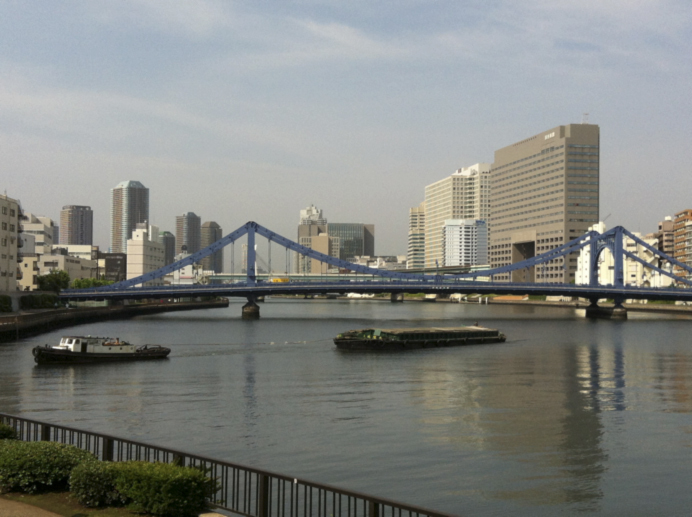 The graceful confluence of the Sumida and Onagi Rivers with Kiyosumi Bridge in the background – blue of course! Dogs are the reason to walk along the river. 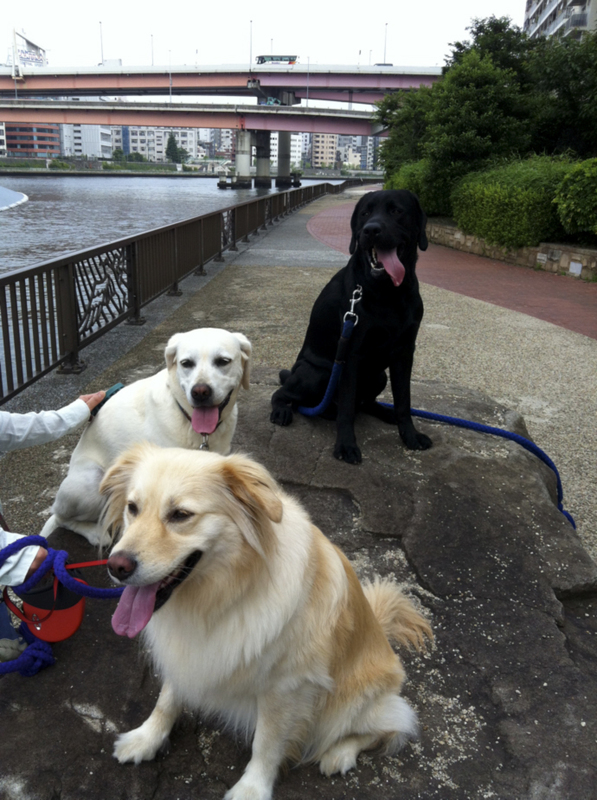 Here Komachi, Kyoko and big tongue Basho stop for a breather. 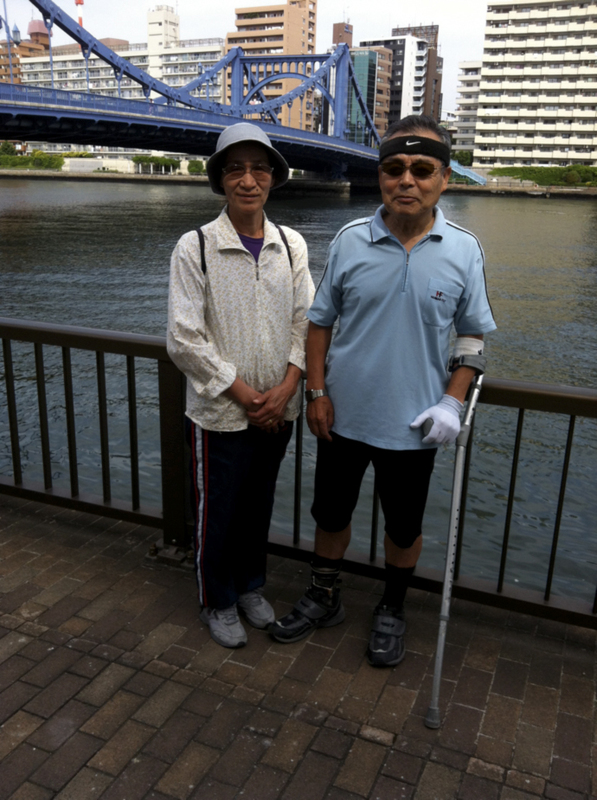 Mr. & Mrs. Sugimoto, fellow walkers along the river way. He sometimes walks to City Hall in Shinjuku when he has a complaint to register. Once they walked round trip to Blue & White, probably 25 kilometers/ or 15 miles! He just had to see what it was. He’s a painter now exhibiting in Ginza. His determination is inspiring. She makes it possible. 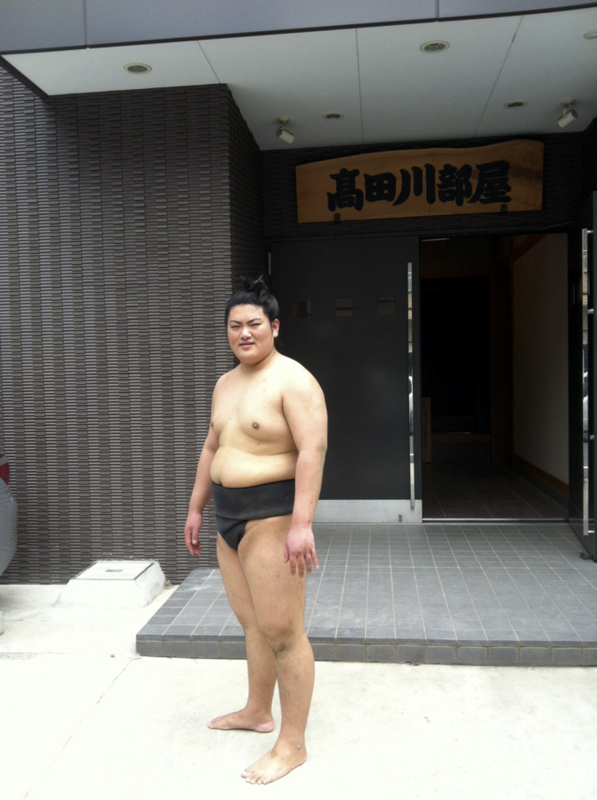 The neighborhood teems with sumo stables. Here is a moderately slim wrestler who wouldn’t let me photograph his sandy backside after he had taken tumbles during early morning practice. 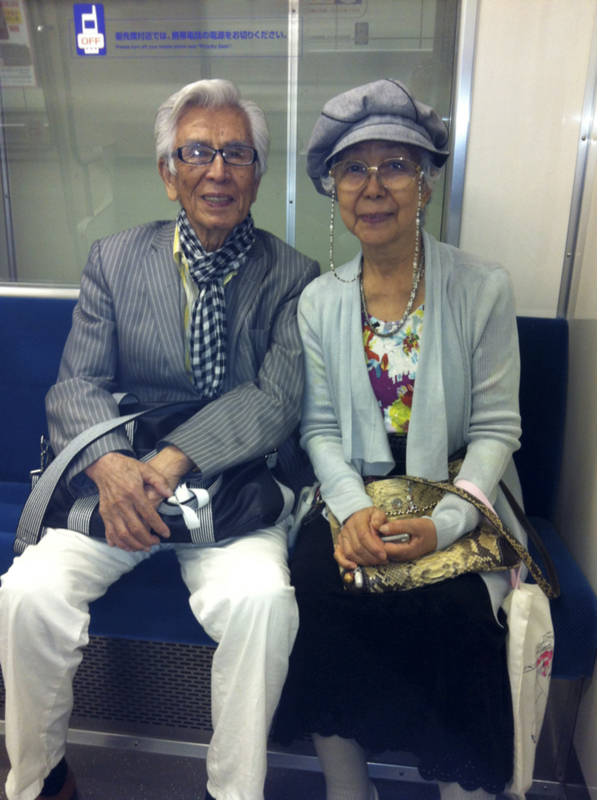 Mr. and Mrs. Yoshimoto, he 85, she 76, styley fellow travellers on the OEdo subway line I take from Kiyosumi Shirakawa to Azabu Juban home of Blue & White. 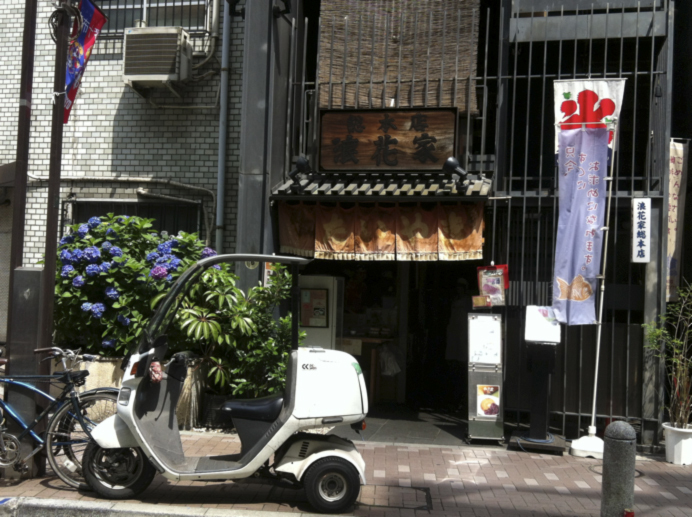 Naniwaya Sweet Shop and café, the most famous landmark in Azabu Juban. People come from throughout the land to taste their Tai Yaki, fish shaped waffles filled with hand brewed and mashed sweet red beans. 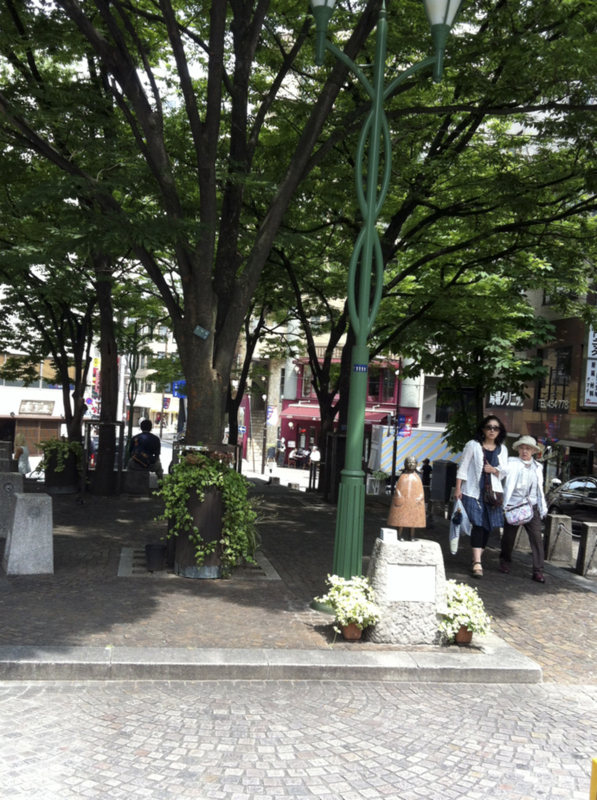 Azabu Juban Patio, scene of 1st Saturday of the month flea markets, Azabu Juban Matsuri in August, and pottery and vegetable markets throughout the year. 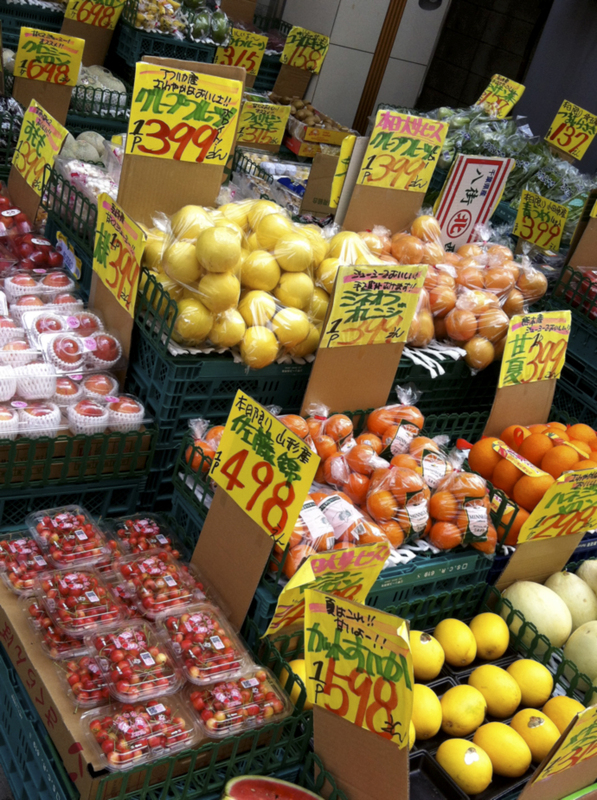 Colorful fruits and veggies at Bikkuriya vegetable shop around the corner from Blue & White. Blue & White where good things come together and connect Azabu Juban with all who come from Yokohama or from Singapore, from London or Boston to catch the vibes. Featuring the best of Japan for 36 years, with one of a kind displays of windows and grasses and flowers plucked from the side of the road and arranged by Sayoko Hayasawa, the charismatic manager who is a force in herself and always has time to welcome all visitors and hear their stories, laugh a bit, share a hug and sometimes a tear. 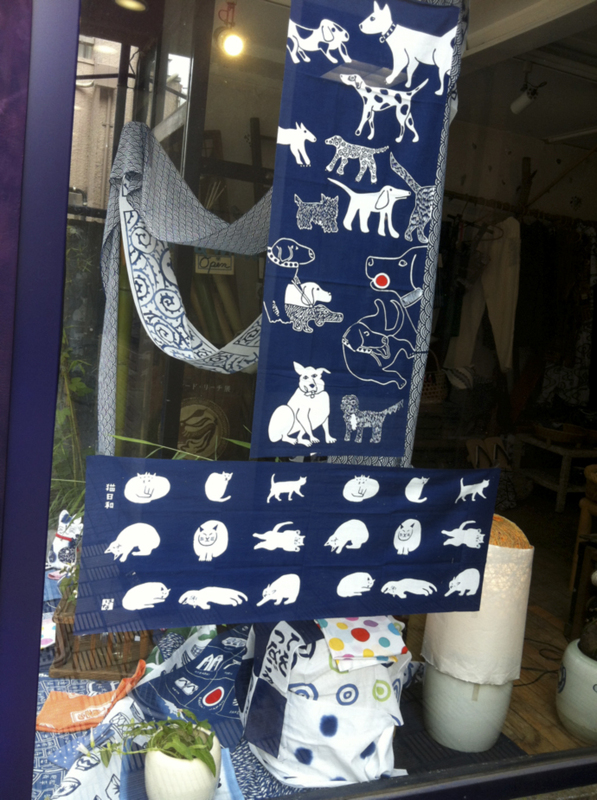 Tenugui, hand-dyed towels featuring dogs and cats and other things of daily life. Whichever, wherever is home, one smiling lady is there to make me (and you) feel welcome. Her headquarters is at Blue & White where she appears in uncountable forms. Otafuku’s bright faces tells us we belong right where we are. This once in a lifetime, original Otafuku sponge cake was the from scratch creation of dazzling granddaughter Ruby Momo Kaminsky, the artist of the doorway welcome on the first page. Like Otafuku, Ruby welcomes all who come to play with her. She knows what life is about and where home is. Did we pass in the air? I am doing Boston now after several weeks on the West coast. I see great similarity in our perspectives. We pass on the ground and in the air. We travel the same roads, only one is far more crafty, not to mention talented than I. But we do share our love for Japan, with anyone who asks. I was in your shop a number of years ago and loved it so very much and still adore the treasures that I bought there. Of course, they are “Blue & White”! Thank you for today’s blog. It brought back memories of Tokyo and all of Japan; which I fell in love with on my first trip in 1987. I was glad that Home brought back memories for you. The good stuff is still here. Blue & White, and I, will be waiting. So glad you still remember your visit and the Blue & White things keep us in mind. Happy that you fell in love with Japan. Such a thought provoking post Amy, I can understand how you have been wondering about the next step. I don’t think where we are, in the physical sense, is very important. What matters is where we are in our heads, emotionally. If we are happy, we will be happy anywhere. If we are content, we will be content whether we are rich or poor, healthy or not, in Japan, USA or on the Moon. Blessings to you. What a lovely essay on the essence of coming home! As a military wife, I distinctly remember when a new place finally became home: that sense of “Tadaima!” that I felt whenever returning from somewhere else. Even though I have lived in the United States for almost eight years (after living in Japan for a decade), I still feel as though I am home when I land at Narita for a visit. Thank you, Amy, for eloquently expressing this along with charming photos. 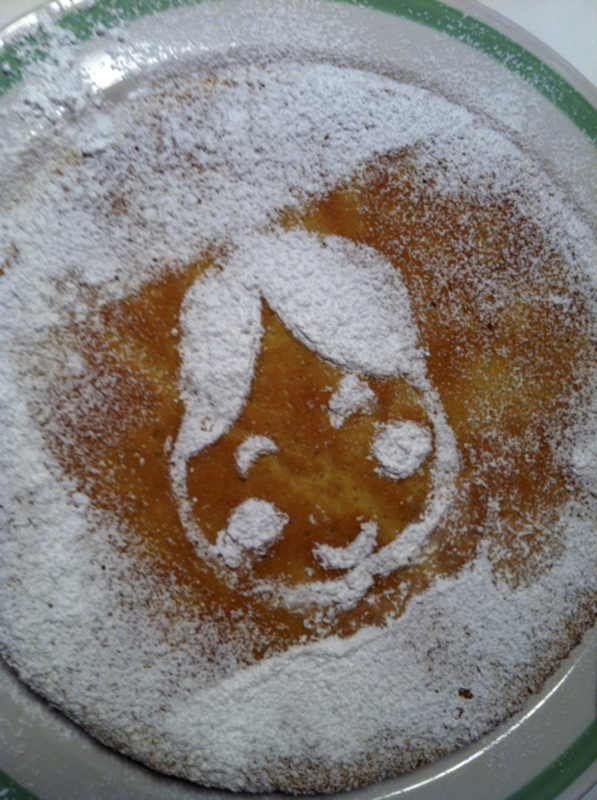 it was not sponge cake but almond cake! and what a super grandkid you are. and a great cook as well ! I have met you and been to your shop a number of times in my 35 years here in Japan. I mostly lived in Tochigi ken but for the last 5 years at our summer house in Miyagi ken. I totally feel the same ‘ Tadaima ‘ when I return after a trip abroad . A super essay, thank you. To “know what life is about and where home is”. That is quite a gift! Amy, your post is sheer pleasure. 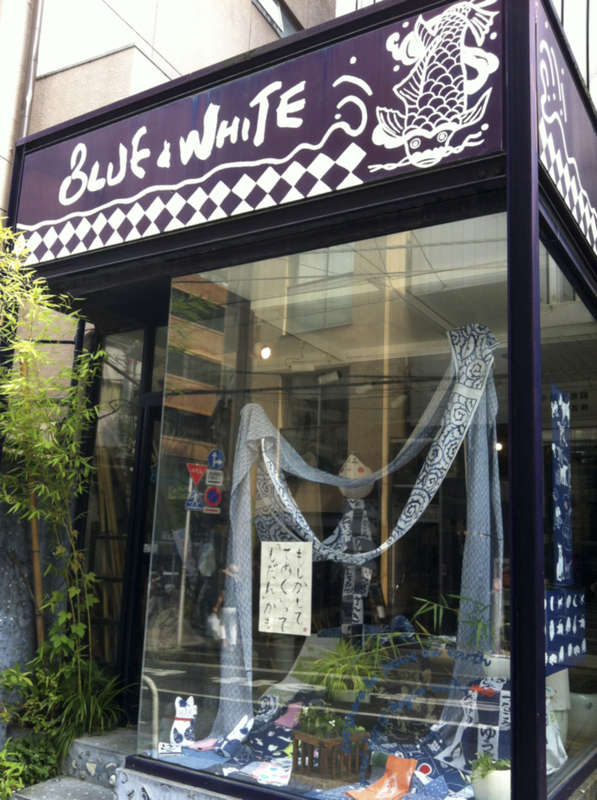 As is your bountiful shop, “Blue & White”. I have been to your shop only twice, but in my imagination, I have been there a thousand times. I adore it! 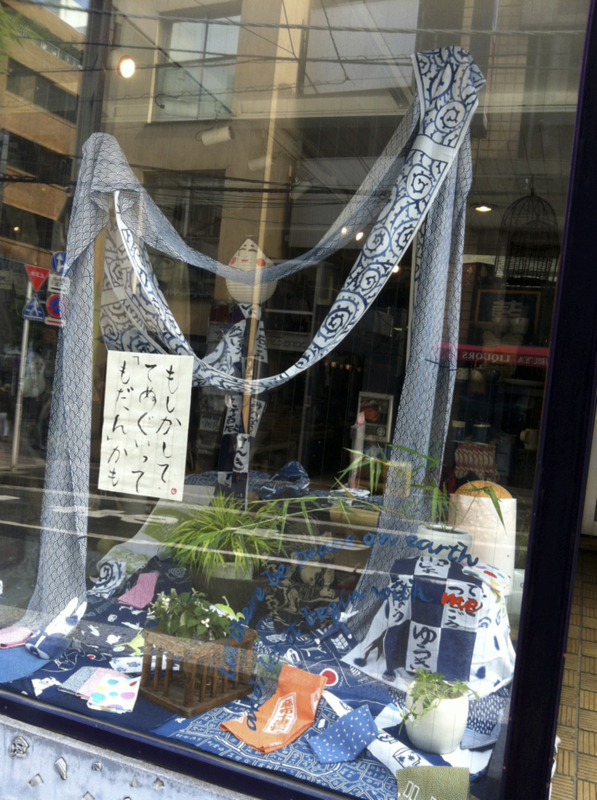 Seeing the adorable tenugui sparks my imagination, no end! I live in New Mexico now – back home after many years away. When I want to immerse myself in Japan, my home for only three years, I pull one of your lovely books off the shelf and sit with a cup of green tea, remembering. More than any place other than my home of origin (New Mexico), Japan influenced my life. Thank you for this evocative blog post, for your wonderful books, and for Blue & White! And, welcome home. I have visited little bird farm more than once and thought I spied you at home on your sofa sipping your cup of green tea, drinking in memories. We returned yesterday from our old farmhouse in the hills to downtown Tokyo where a river runs by. From home to home, that too is a transition. But all of our homes can inspire and nourish. Each in its way. And sometimes, when we’re lucky, a we can encounter a new place where we feel welcome and inspired. You and I have found the same new home. Let’s meet here together one day. It’s good to be home. I am an occasional visitor to your wonderful shop when I am fortunate enough to come to Japan. Your essay hit “home ” for me. I think the sense of “home” must have universal applications. You speak to the ineffable sense of belonging in or to a place and that is many faceted and can be experienced on many levels. I’ve been living in California now for three decades but have found myself increasingly thinking about returning more frequently to my “roots” in the Northeast. But, my creative juices really flow when I return to Japan, even though it’s only once a year for a few weeks! If I could, I would follow my bliss and come to live in Japan. I think each “home” brings different responses, some on an almost subliminal level! Your essay helped me to see that we can have many homes, each feeding and nourishing our life in unique ways. You touch me with your remarks. I am glad that someone else feels as I do every time I walk into Blue & White. That is surely a home for me, and, I am glad to know, for many others like yourself. Like you, my roots are in the Northeast – Boston where I was born, raised and educated until my path veered radically and unpredictably west to Japan. An unexpected change, but one whose rightness for me keeps reaffirming itself. For me too Japan is a source of creative inspiration, and does kindle certain fires inside. For me, there must be fire at home. And yes. We can have many – why not ! Thank you for your deep insights.